I bet you thought I forgot about Meatless Monday with it being Valentine’s Day? Nope. Not a chance. And to boot, I have a lip smacking sandwich down to last bite. Roasted Almond Butter with slices of pear with a drizzle of Agave on it. Doesn’t that sound delish? As you can see above, I couldn’t even wait to take the picture of the sandwich. I devoured half it before I realized that this amazing sandwich was my Monday post! Now, don’t run to the food processor just yet. Read on. I know it is hard since you are positively salivating for this sandwich. Where did I find this combination sandwich? 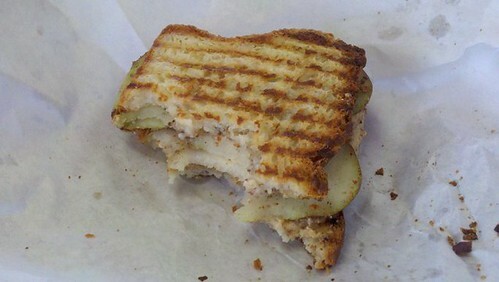 My local health food store makes this sandwich as one of their regular entries. I eat mine on gluten free bread since I have given up wheat for awhile. Giving up wheat may have been the answer to my five month of vegetarian gas issue. (I know too much information, Anna.) Ever since I got off of gluten, no more gas. Now back to this amazing roasted almond sandwich. You can buy almond butter in the store, but I warn you it is quite pricey. You can literally make it yourself. I made homemade almond butter and it was amazing. All you need is either whole almonds or silvered almonds. I roasted whole almonds because I like that roasted almond taste. For a milder taste, you can use silvered almonds. See this recipe. In case time is an issue or you just don’t want to bother, you can hop over to the GT store and buy organic, raw unpasteurized almond butter. Almond butter is pretty amazing by itself but if you like pears, the two paired together is a new level of awesomeness. (I couldn’t resist the pun. Get it? Paired together?) Be sure to get a ripe organic pear at the market. I chose a Red Anjou pear because I liked its color, but any pear would do. If you are not a pear lover, I am sure bananas or apples would do just fine. Now, you got me thinking…. Now, some would say if you have a sweet pear, why bother with the agave? The agave just gives it a rich sweet taste. Since, I have cut down on my sugar intake, the agave just seems just too sweet for me. Personally, I think you can skip it. In addition, Agave has gotten some bad press lately in some circles since it isn’t a live food and has a high levels of fructose. How do you feel about Agave? My health food store’s gluten free bread is okay, but not great. But if you want to buy bread, I heard Rudi’s gluten free bread is good. What are some of your favorite veggie sandwiches? Have a favorite veggie based soup recipe? What did you cook for Meatless Monday? These sound delicious! Almond butter is the best! I got turned on to it a while back because I have a mild allergic reaction to peanuts.